Rafael Hurtado Jr. was born and raised in Chicago’s Little Village, a neighborhood known for its vibrant Mexican culture. Rafael grew up feeling a strong connection to the community. He became involved with the Little Village Environmental Justice Organization (LVEJO) at the age of 15 and remains involved with educating people about environmental justice and the harmful effects of polluting industries in Little Village. His work at LVEJO has helped him see the strong correlation between environmental injustices and crime in his neighborhood, which ultimately inspired him to pursue a B.A. from the University of Illinois, Chicago, with a major in criminology, law and justice. As a community organizer within LVEJO, Rafael worked on several campaigns such as Open-Space, which was successful in the remediation of a super-fund site, currently being converted into the first new park Little Village has seen in over 80 years and the Clean Power Campaign, which was successful in the shutdown of both the Crawford & Fisk Coal power plants. Rafael also sits on the steering committee for Voces Verdes, which has helped him learn the importance of civic-engagement on both the federal and state level. 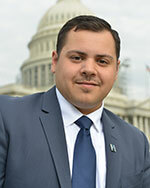 As a CHCI Public Policy Fellow, Rafael hopes to learn the inner workings of our federal government in an effort to encourage and assist individuals communicated their concerns from a grass-root level to the Federal level.